World records are not easy to obtain. They require a lot of hard work, dedication, and drive that not everyone is willing to sacrifice. In the industry of skydiving, setting world records take even more courage. 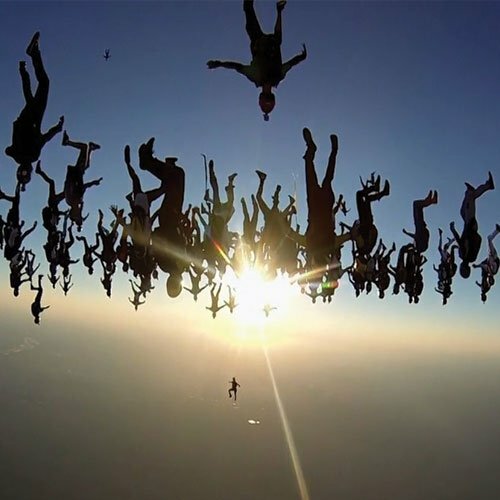 The following are the top 10 world record skydives in the history of the sport. On October 14th, 2012, Felix Baumgartner broke not only the record for the fasted freefall speed at 833.9 mph but he also still holds the record for the most views on a YouTube live stream video ever. Felix has always had a passion for crossing boundaries. He made his first skydive by 16 years old and has since set numerous world records. Baumgartner is a licensed gas balloon pilot, private helicopter pilot, and a commercial European helicopter license. Click here to watch the video! On December 1st, 2013, 65 women in Arizona broke the world record for the most number of women to link arms in a vertical formation. The women, from all over the world, took two years to prepare for their 18,000 ft skydive. The maximum speed reached by the skydivers was 165 mph. It took 7 aircraft and four videographers to make this record-breaking skydive possible. Click here to watch the video! On September 22nd, 2012, 100 skydivers became known as the pioneers of wingsuit record breaking. With the evolution of wingsuit technology, this record is sure to be broken in the upcoming years. 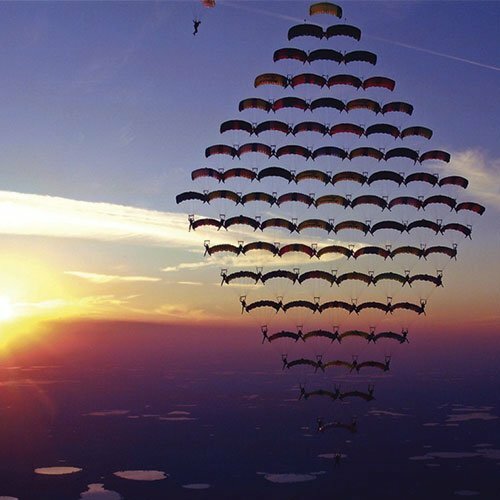 The diamond formation jump took place in California and is known as the largest, unlinked wingsuit formation in the world. Click here to watch the video! On September 26th, 2009, 181 women broke the world record for the largest women’s formation in California. In a sport dominated by men, this is an impressive accomplishment for women. The jump, focused on breast cancer awareness, lead to the release of a documentary movie called Pink Skies. They also started a foundation called Jump for the Cause. To watch the video, click here. On September 9th, 2006, Jay Stokes broke the record with 640 jumps in one day. The risk involved with skydiving increases with the addition of fatigue and exhaustion. 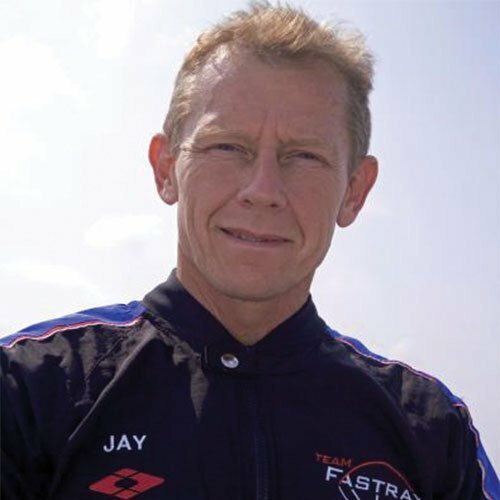 Not only has Jay broke this record but he was also involved in the 2016 world record for the largest night skydive formation. He has experience with both military and civilian skydiving teams. To watch the video, click here! On November 21st, 2007, 100 people gathered in Florida to break the record for the most people in a canopy formation. The formation, in the shape of a diamond, will likely be expanded into a larger formation with the advancements of parachute technology. However, this record is currently listed in Guinness World Records. Click here to watch the video! On July 31st, 2015, 164 skydivers flew head-first at the ground. Traveling at about 240 mph, the jump over central Illinois was the 13th attempt to break the previous record. Skydivers from all over the world were flown up to 19,700 feet in seven different aircraft. If you want to watch the video, click here! 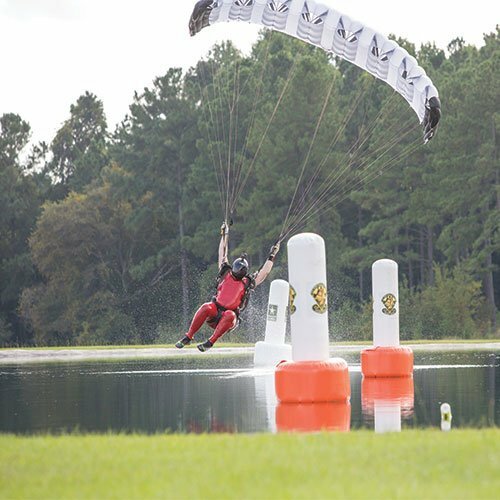 On June 15th, 2012, Greg Windmiller swiftly sped through a 70-meter course in 2.4 seconds! With the evolution of canopies, faster speeds are still expected to be seen. 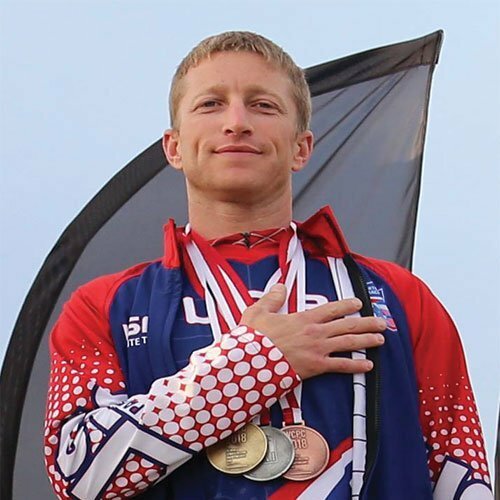 Greg is a combat veteran that specializes in teaching, coaching, and mentoring several skydiving concepts. He is also the business owner of Superior Flight Solutions. Under his belt, Windmiller has over 26 years of military experience, 23 years of freefall operations experience, and 20 years experience in both tactical and non-tactical environments. Click here for the video! On June 15th, 2012, Nick Batsch destroyed his competition with his distance. With a record of 730 feet, it is undisputed that Nick is one of the best canopy pilots in the world! His first jump was at age 19 and today, he has a total of 10,000+ skydives. Batsch plans to continue furthering his experience of becoming a more recognized coach. Click here to watch the video! 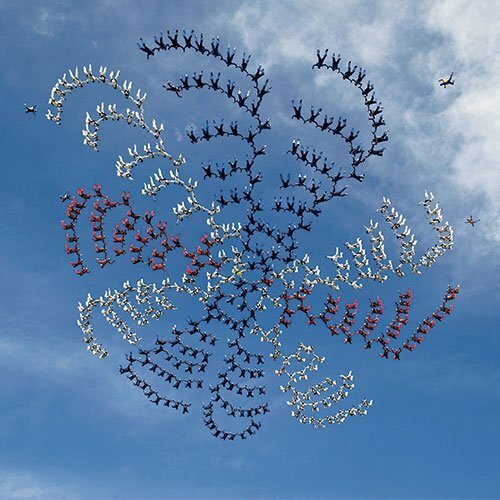 On February 8th, 2006, 400 skydivers from all over the world came together to set this record. In order to make this event happen, they needed the support of 4 C-130s. The skydivers jumped out of the plane at an altitude of 24,000 ft. All 400 skydivers linked hands for more than four seconds during freefall. They also hold a record for 672 unlinked skydivers over Bankok in 2004. Click here to watch the video! Even if you don’t want to break skydiving world records, skydiving is a thrill that every able-bodied person should experience at least once in their life! Take a leap of faith today with Georgia’s best and most trusted dropzone! 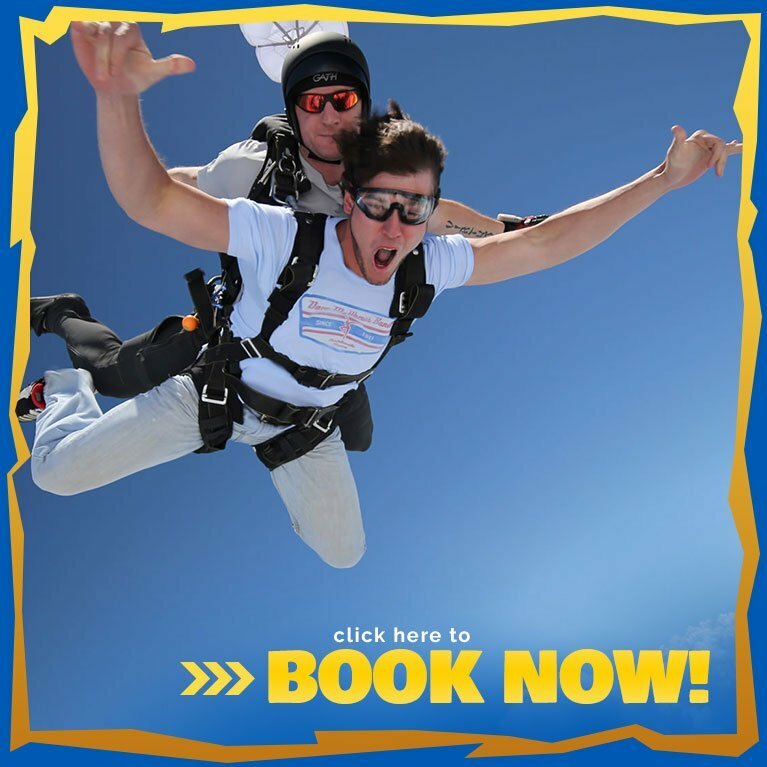 Call Skydive Georgia at 770-684-3483 today!